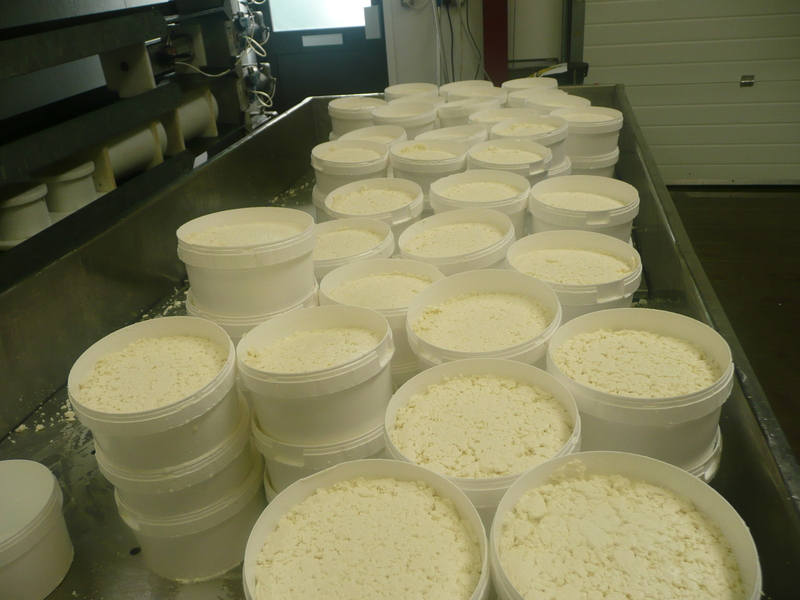 Making sheep cheese is always exciting, because the amount of curd never fails to astonish. Whilst we make a rule not to make cheese on a Friday as this is the day we do everything else and catch up on, we break that rule for our deliveries of ewe’s milk from Feb to June each year. 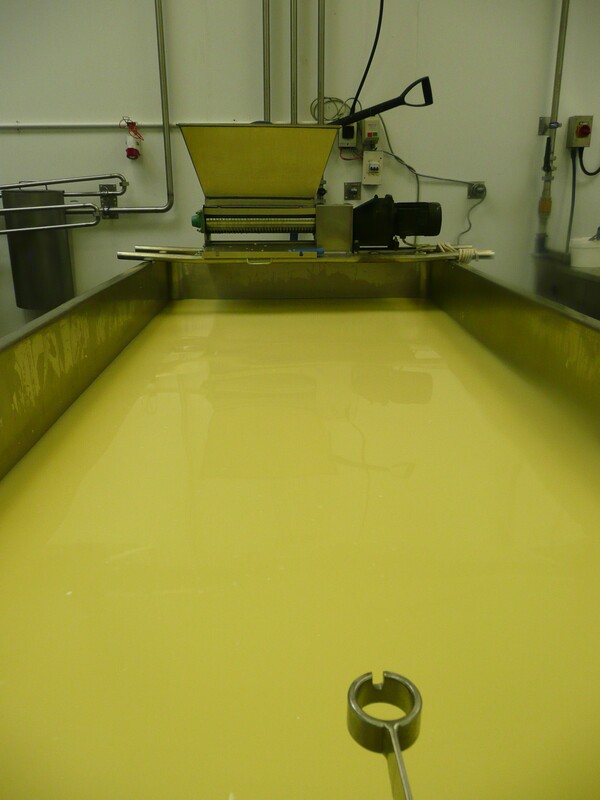 I have included in this post a series of pictures that shows pretty much all the steps involved in cheese making. I hope it is interesting info. We start off by ripening the milk with the chosen starter culture, then renneting it and cutting it. This recipe rennets quite fast and gives a good cut. The pictures start from cutting onwards. I start with a vat of ewe’s milk (see above left for a picture of our small vat) – it is not as white as goat milk but less creamy yellow coloured than our cow’s milk; sort of an inbetween colour which is a little odd as it contains almost twice the amount of fat as goat milk. On average, for every 1,000 litres of goat milk, you will get 100kgs of curd and 900 litres of whey. The same is true of cow’s milk, but with ewe’s milk, depending on the recipe and the time of year, you can be looking at double this! We receive around 1,900 litres of ewe’s milk per delivery from the lovely Andrew, one of Simon Stott’s tanker drivers. Because of the high yield of ewe’s milk, we do not put too much in the large vat as it becomes unmanageable for us as we do everything by hand. 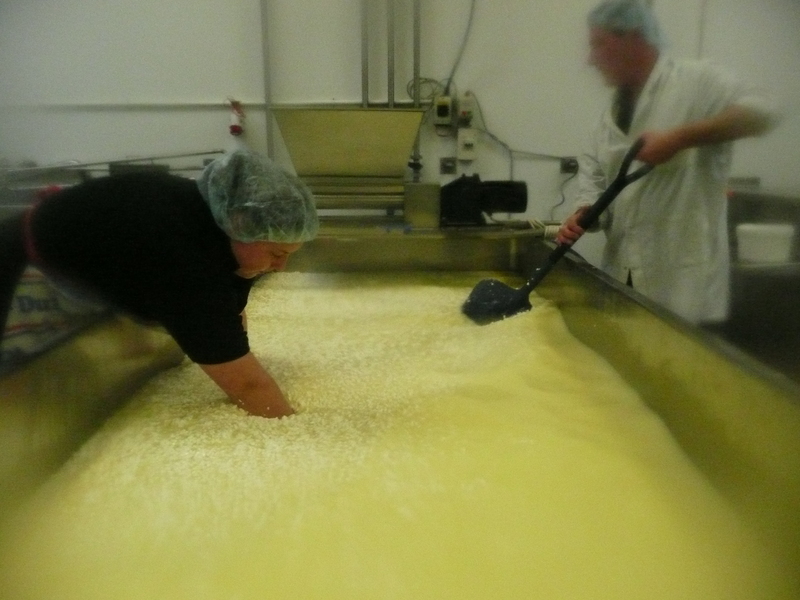 The picture right shows Stu cutting the curd in the big vat, with both hands. The curd is so dense and there is so much of it, cutting really is quite hard work. The picture left is Lydia and Stu stirring the curd during scalding. 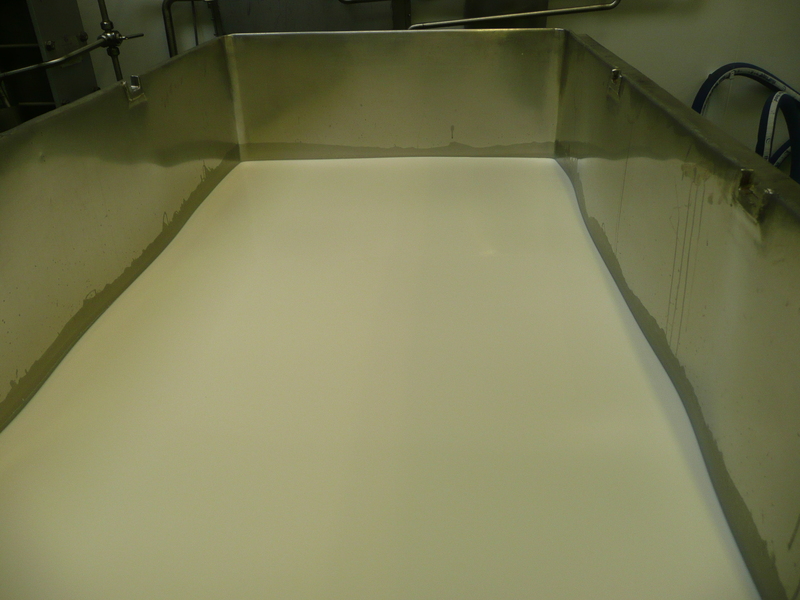 If you think about it, the curd and the whey amount to around 1.5 tonnes, which is an awful lot to stir by hand. The picture above, middle is the lull before the storm. The curd has been cut and scalded. Here it is pitching, ready for whey off. I like whey off; I like seeing the whey disappearing from the vat as it is pumped up in to the whey tank, revealing mountains of curd. My favourite three bits of cheese making are cutting, because I like the transformation from liquid to set milk to pieces of curd which eventually set again in their pots; always fascinates me! I also like testing the curd to deterine whether it is ready to be cut. And I like whey off and shovelling as I consider that as my exercise as we don’t have gyms around where I live. The picture below shows Stu starting to cut the curd in to blocks after whey off and distribute them down the side of the big vat. At this stage, the little vat is still scalding. We try and make sure there is a decent time lag between the two vats, otherwise it all gets a bit crazy. lot easier for me. One day, I am either going to fall in or someone is going to ‘accidentally’ push me in the big vat! (although we are pretty equal on the shovelling stakes!) so his blocks tend to be bigger than mine. 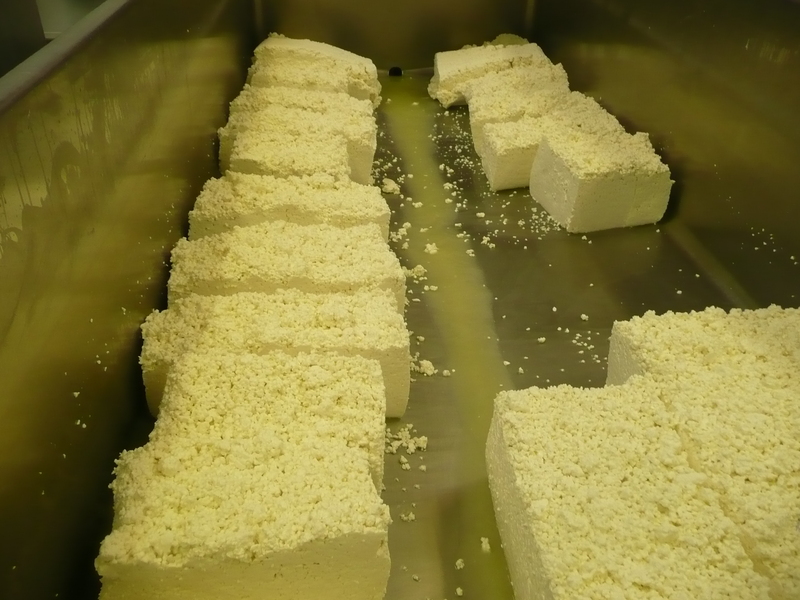 It helps to have thick blocks as the weight helps to expel whey as this is what this stage of cheese making is about. We want to dry the curd by turning and expelling whey. 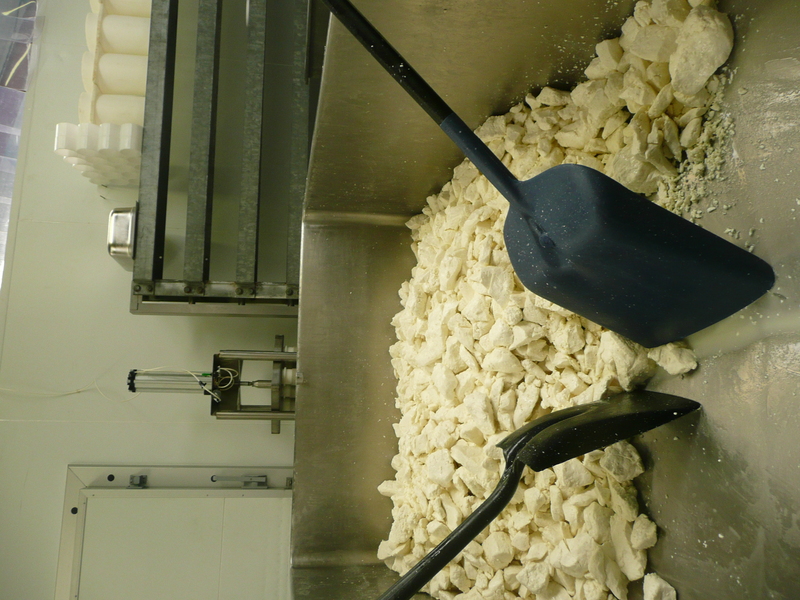 When the curd reaches the right acidity for the recipe, we then cut into squares and the shovelling begins. The picture middle above shows Stu and I having shovelled until the final acidity where we need to salt. The picture on the right above shows the freshly milled cheese, ready for the three of us to pot up. 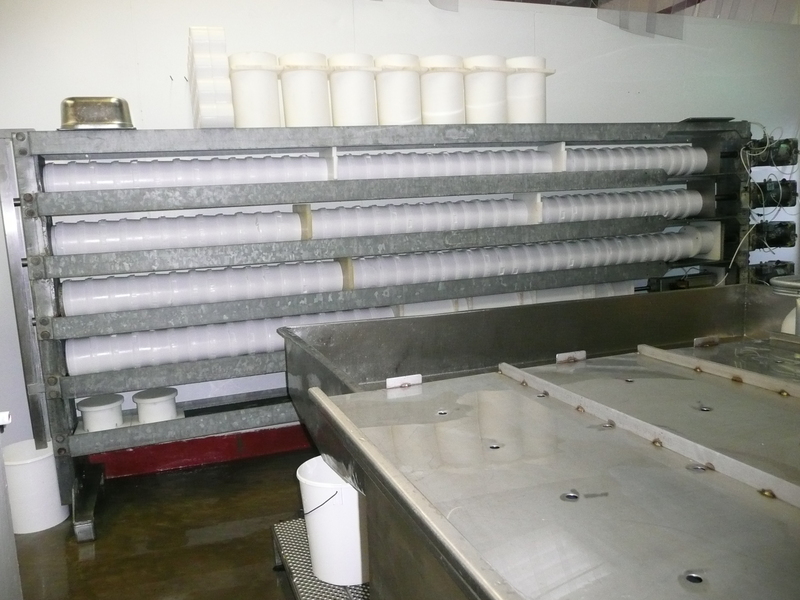 The picture left shows cheeses newly placed in the pots, settling, ready to be clothed up and placed in the press. Below middle, me clothing up. We use reusable cheese cloths as I do not like the idea of throwing away thousands of disposable cheese cloths each year. Instead, we give them a good boil wash and continue to use them. 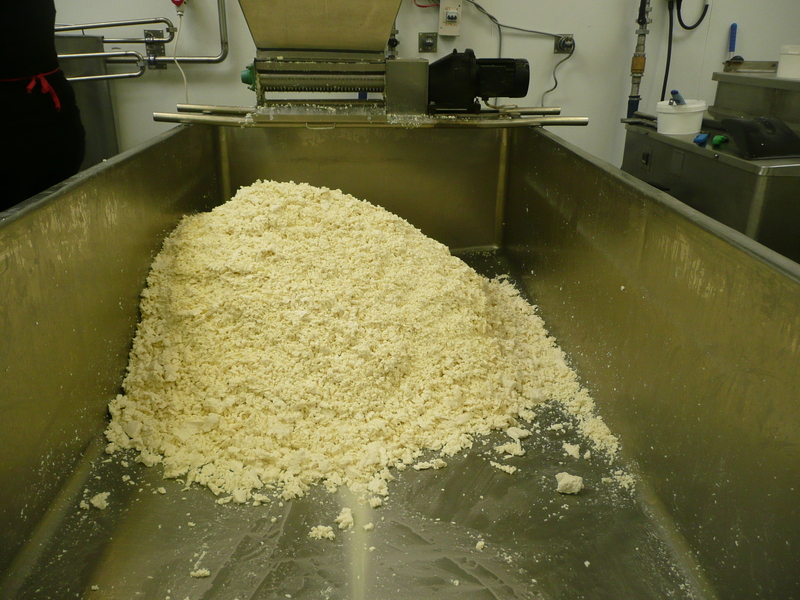 And the final picture below is the sheep cheese in the press. Wow, brew all round and the wash down commences so that you would never know we have had a big day cheese making, other than the full press. It was a long and hard Friday, and if I am truthful, I experienced a few aching bones on Saturday, the day after; that was a lot of shovelling. All three of us looked after the two vats as Lydia did not open up the shop. It was a good make, and the guys, Stu and Lydia knocked out today and vac packed. Early signs are good. We now need to transfer it to the maturing room for the next 12 months or so to let it develop its lovely nutty, buttery flavours. Next sheep make is 24th March if anyone wants to come and help?